As you can see, I did add clutter. The buildings have loads stacked up against them, largely to ensure they get positioned correctly. The large crates and small barrels are from Gilbow – superb accessories, among the best on the market in my opinion. The other crates are Peco and the red-ended barrel is Merit. The pile of sand is a discovery of my own. There’s this substance you can get in art shops known as gel medium. Essentially, the idea behind this is that you add it to paint to give your paintings texture. It comes in several varieties and can be easily shaped. It costs a little under £10 a jar, but is incredibly useful. I’ve used it to represent sand, gravel and pebble dash in the past. Here, I mixed it with Games Workshop’s “Snakebite Leather” paint, which creates a nice sandy colour. The tractor is an Oxford die cast model and the car is Classix. I don’t intend to fix the vehicles down, as they’re a handy way of setting the period. I want this to be fairly flexible in terms of setting, just so that nothing I run there looks totally wrong. Conceptually, this is basically a smaller version of “Micklewhite Wharf.” At the moment, it’s called “Semple Town,” which I hope people won’t take as a comment on its builder. It’s set in East London on the south bank of the Thames – the distant buildings on the backscene are supposed to be on the far side of the river. The name comes from the tendency of places in East London to be named after industrial firms – Canning Town, Silvertown, Beckton. This is the works of Harry Semple. I have no idea what Semple’s factory produces, but it certainly requires a large variety of rolling stock. Much of this has been inherited from Micklewhite Wharf, for the obvious reasons that (a) it’s the same setting and (b) both layouts require compact stock in order to be satisfying to run. Above left is the Terrier, the “main line” engine. 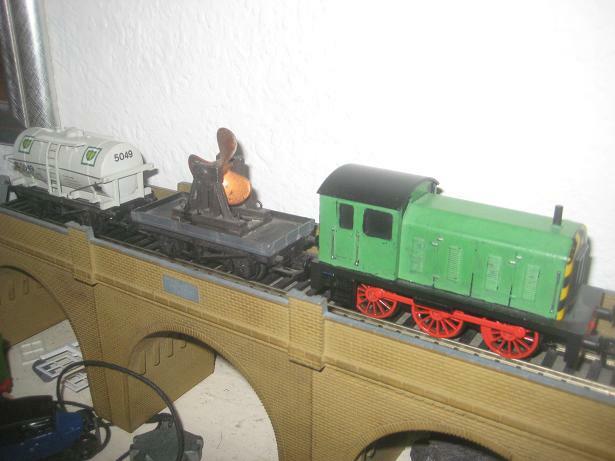 It’s also the longest engine on the layout, which might be a first for a Terrier. 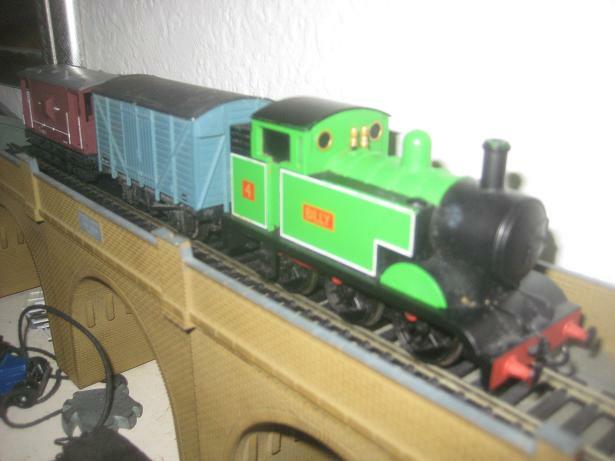 It’s hauling the workmen’s train, which consists of repainted “Emily’s Coaches” from Bachmann’s Thomas the Tank Engine range. There’s barely enough room for the engine with both coaches, so most of the time the train will consist of one coach. The Terriers, as I’ve said before, were typical East London engines and could be found both north and south of the river. Above right is Billy, a rather battered Bachmann Junior locomotive. For a while, Bachmann produced this and an 0-4-0 saddle tank using the tooling from their American Thomas range. Unfortunately, this got them in a bit of trouble with HIT Entertainment, Thomas’ copyright holders, and so have been withdrawn. Detailing is minimal and they’re basically freelance, but I think they look rather neat. I was going to repaint this one, but I think I might just weather him down a bit. The engine on the left is another Bachmann Junior engine, this time a somewhat Hunslet-esque diesel shunter originally named Rusty. I’ve repainted it and slightly weathered it, and coincidentally it matches Billy’s colour quite well. The wagon immediately behind is a curiosity, and not actually mine. My brother picked it up second-hand, and due to a lack of space and time I am the current custodian of much of his stock. The lack of markings suggest it’s an internal user wagon. As the bro said, it’s quite a nice thing to have on a Docklands layout. The railway still isn’t finished. The more I do, the more I find to do. I’m sure you know what I mean. But given that in terms of total hours I’ve spent less than a day to get this far (not including drying time for glue) and considering that I’ve spent less than £10, I’m quite pleased. WARNING: This entry takes a while to get to the point. You may want to scroll down to where there are pictures. I know I would. As you may have gathered from previous entries, I’m not exactly what you’d call a rivet counter. I’m more of the Impressionist school of modeller, in that I’d rather create something that feels right than something that’s precisely accurate. Put it this way – Hornby Dublo, to me, often seems more “real” than finescale stuff because it has a real weight and momentum to it, despite the fact that the detail is often laughable by modern standards. 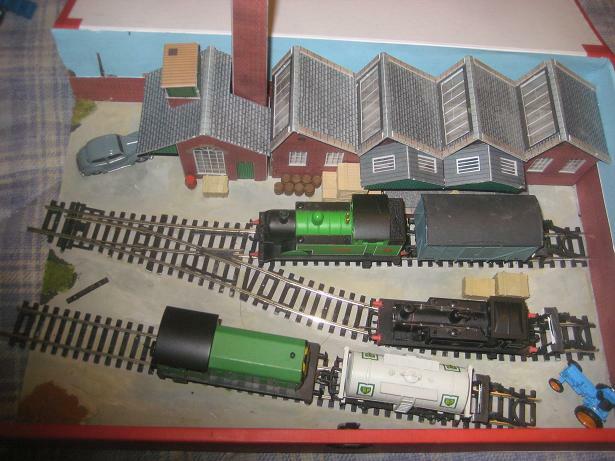 Similarly, my favourite layouts are often the ones where there’s less attention to detail, where the builder has shunned conventional accuracy to create something genuinely different. Quite often, these are created by people who are new to the hobby. 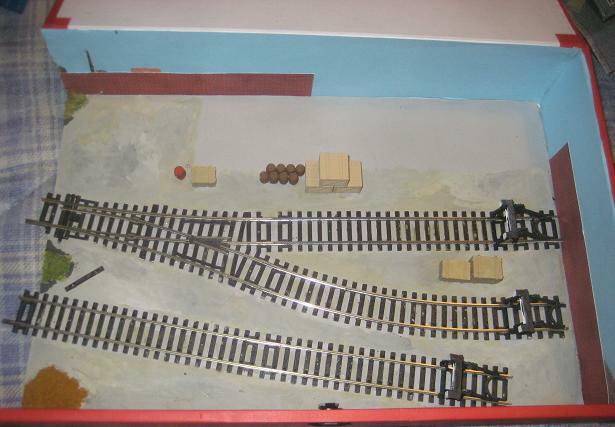 I recall British Railway Modelling published articles on Midge Grassing’s Sancliffe Junction some years back, a layout created using some unconventional scenic techniques which, as a result, really stood out. See http://www.ngrail.co.uk/2_sand.htm for some photos. I also enjoyed Model Rail‘s recent article on artist David Shepherd’s home layout, built according to the philosophy that “‘it’s my railway and I can do what I bloody well want with it'” (to quote the article). Even Allan Downes, who has been wowing us with his buildings and scenery for decades, admits that he doesn’t worry about getting things dead on, provided they look like what they’re supposed to. However, this philosophy doesn’t necessarily mean that you can get away with anything at all, as I discovered while researching my current project My layout is set in the East End of London, and one of the things I wanted to include was track on more than one level – a characteristic of railways in East London is that they are carried on viaducts. My initial thought was that I could just get away with weathering Hornby’s standard single-arch road bridge, which is already brick red. I mean, bricks is bricks, right? It turns out not. See, my research, which largely consisted of wandering around the East End with a camera looking suspicious, showed that brick viaducts in the East End are yellow. This, according to people who know these things, is because the bricks were made in Kent, where the clay is low in iron. Anyway, what this meant in practical terms was that I was completely wrong. I could still use red brick – there are red buildings in East London – but yellow would be better for creating the feel of the area. Yellow brick viaduct, East London, apparently in the middle of an atomic explosion. And so I set to work with various shades of brown and yellow. In addition to the fact that the colour was wrong, it was also clear that I was going to have to do quite a lot of weathering. For the base coat, I used Games Workshop’s ‘Bubonic Brown’ (are buboes yellowy-brown?). Then I went over with several layers of ink and thin, grey-brown paint. This adds depth to the basecoat, as well as bringing the colour closer to what I was aiming for. One technique I used was to apply slightly darker paint to areas such as the underside of the arch and below ledges – areas that, on the real thing, are in shadow. This is because, with the best will in the world, you can’t scale the actions of light and shade down. Therefore, in this scale, shadows look a bit feeble unless you give them a helping hand. Here’s the result, as compared with an unpainted bridge. It’s not perfect, I’ll admit. It’ll need several more layers of paint before it achieves the old-and-dirty look I’m aiming for. But it’s a massive improvement over the out-of-the-box road bridge, and now looks like it might actually be made of bricks. Incidentally, I took several close-up photos of brick and concrete, which I will bore you with in a future entry. Is this the world’s laziest model railway? Are they allowed to do that? So, what aren’t they making?